The ocean and atmosphere each react to changes in the other. These reactions and counter-reactions can snowball until the system builds to a point where potentially disastrous effects occur, such as the El Nino events of 1982-83 and 1997-98. This site describes how the Jet Propulsion Laboratory's TOPEX-Poseidon satellite was used to monitor the amount of sea level rise in the Eastern Pacific Ocean, and consequently the amount of heat stored in the water. Sea level and temperature data from TOPEX-Poseidon was used successfully to predict the 1997-98 El Nino event earlier than ever before. 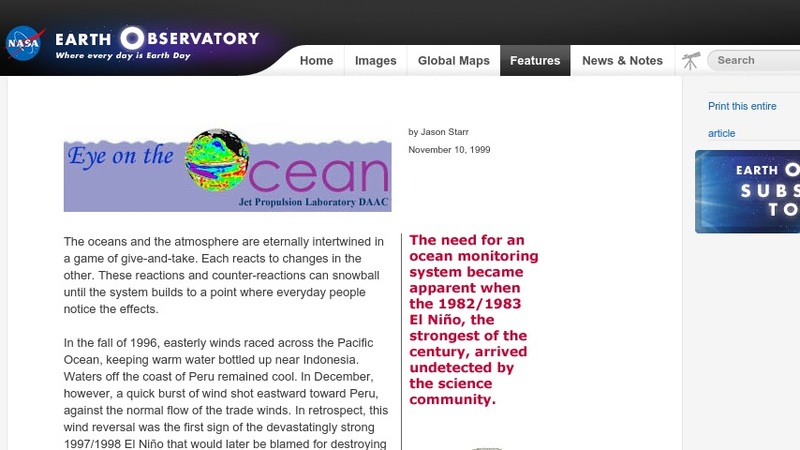 It features text, remotely-sensed imagery and a link to JPL's Physical Oceanography website.